Titanfall is one of the best PC games of 2014 so far, thanks in no small part to maps which freed like Battlefield and funnelled like CoD and somehow captured the best of both in fifteen minute matches. Frontier’s Edge DLC map Dig Site’s the latest to subscribe to that philosophy – forcing Titans down narrow pathways between industrial processing buildings while pilots leap over their heads. Dig Site sees players parkour pirouette about an operational mining facility. The story goes that the site is a critical war asset, shut down while the Militia defend it from the IMC. The facility is protected from air assaults by the natural, sheer rocks that surround it. Combat, then, is a “bloody ground war”. Titans will have to deal with and take advantage of “subtle elevation changes” in the terrain, and pilots need to be equipped for both short and medium-range shootouts. 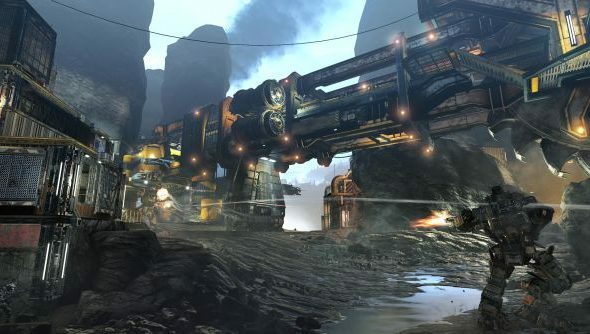 Dig Site is one of three maps set to appear in Titanfall’s Frontier’s Edge DLC. Export is set on the side of a mountain hollowed out by corps, and Haven in and around an exclusive beach resort. Which parts of Titanfall’s levels have you preferred? The wide-open double-jump spaces, or the indoor invisibility arenas?